Our Missouri Folk Arts Program builds cross-cultural understanding by documenting, sustaining, promoting, and presenting Missouri’s living folk arts and folklife in collaboration with Missouri’s citizens. The Missouri Folk Arts Program (MFAP) is a partnership between the Missouri Arts Council and the Museum of Art and Archaeology at the University of Missouri in Columbia, with additional support from the National Endowment for the Arts. MFAP manages the Missouri Arts Council’s folk arts grants. The heart of MFAP is the Traditional Arts Apprenticeship Program. Master artists work one-on-one with apprentices to keep folk arts knowledge alive. MFAP also produces Community Scholars Workshops for local cultural experts, conducts field surveys to map the traditions of Missouri’s diverse regions, co-produces folk arts events and education projects around the state, highlights Missouri folk arts news in the MFAP website’s Show Me Folk blog and the university’s Museum Magazine, and works with local and regional arts organizations to further their missions. Headquartered in Columbia, MFAP is staffed by folklorists Lisa L. Higgins, director, and Deborah A. Bailey, folk arts specialist. They are aided by and provide on-the-ground experience for graduate student interns from the university’s Folklore, Oral Tradition and Culture Studies program. The traditions and skills of Missouri’s folk arts are passed on to the next generation of artists through MFAP’s Traditional Arts Apprenticeship Program. The MFAP staff identify master artists and help them pair up with apprentices in their communities. For several months, the master artists work closely with the apprentice artists to impart the masters’ knowledge and develop the apprentices’ skills. The MFAP staff visit the artists to make an archival record of the teams at work. The first master/apprentice lesson took place on December 10, 1984. Since then, there have been 421 apprenticeships in which 206 master artists have mentored more than 400 apprentices in every region and type of community in the state. Many apprentices have in their turn become TAAP masters, forging another set of living links in the chain of Missouri’s folk arts. Some arts are traditional regional crafts that date back to Missouri’s Native American peoples and first European settlers. Some are arts of new immigrants such as Latinxs, Sudanese, and Bosnians. Among the arts that have been fostered are blacksmithing, cowboy poetry, short-bow fiddling, African-American storytelling, paddle carving, Vietnamese dragon dancing, saddle making, clawhammer banjo, wood joinery, square dance calling, bobbin lace, turkey calls, Mexican paper flowers, and Slovenian button-box accordion. Find out more in our story on TAAP’s 30th anniversary, Masters and Apprentices Strengthen Missouri’s Folk Arts Web. 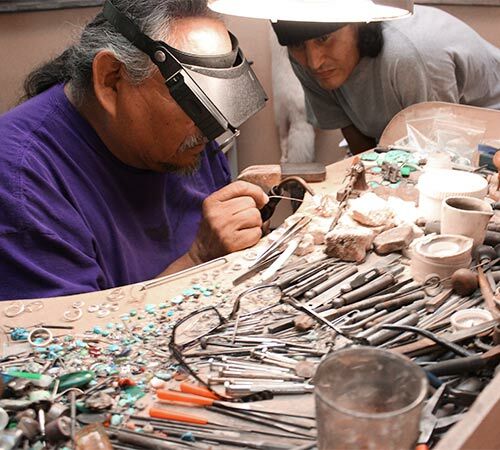 Photo #1 (top): In his Carthage studio, master Joe Hijoe (left) teaches Navajo silverwork to apprentice Nolan Negrette. 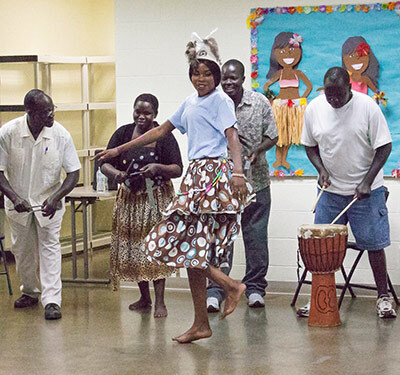 Photo #2: Kansas City boasts a strong community of recent immigrants from southern Sudan, including people of the Kuku tribe. Master Mulu Wani Evans (left) leads his apprentices through the Kuku’s traditional Kore percussion, song, and dance. Find out more in the Museum Magazine article Folk Arts in Transition and in this Facebook post about Mr. Evans on MFAP’s page. 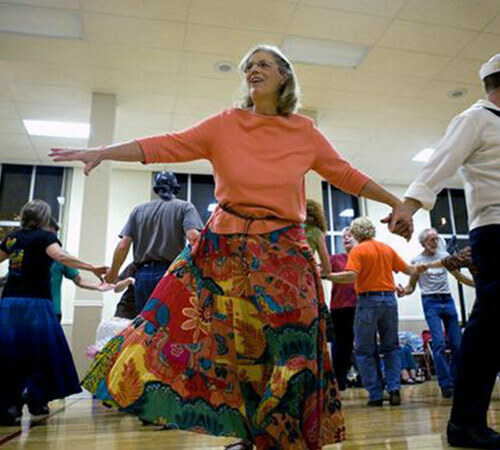 The Missouri Folk Arts Program manages the Missouri Arts Council’s folk arts grants. These grants are awarded to Missouri-based nonprofits to conserve and showcase folk arts in local communities through concerts, festivals, workshops, exhibits, and other events. Among the programs being funded by annual grants in FY2019 are the youth fiddle camp at Historic Bethel German Colony in Bethel; the Autumn Daze Arts, Crafts, and Music Festival by the Downtown Branson Betterment Association in Branson; and the Traditional Moon Powwow as well as Native American exhibitions, film festival, and educational programs by the University of Central Missouri in Warrensburg. 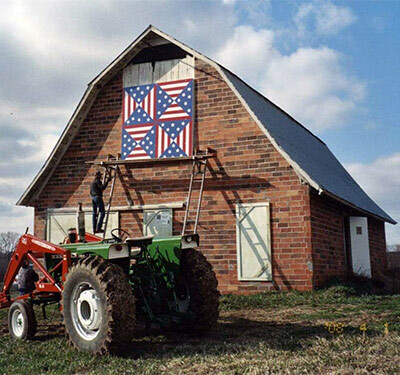 Photo #2: Nearly 60 barns in Cooper, Howard, and Saline counties are adorned with 8-foot-square painted quilt blocks on the Barn Quilt Trail of the Boonslick Area Tourism Council. Martha Holman chose the “Electric Fan” pattern for her farm in Fayette because it matched one of her mother’s favorite quilts. Find out more about the Trail in our article The Boonslick’s Patchwork of Roadside Quilts. People who are enthusiastic and knowledgeable about folk arts in their communities have always been invaluable colleagues in MFAP’S quest to find, foster, and document Missouri’s traditions. In 2010, MFAP created an in-depth practical resource for these regional experts by establishing the Community Scholars Network Workshop Series. Held several times a year in different parts of Missouri, the Community Scholars Workshops help people collect, document, and preserve folk arts whether or not they have formal training in fieldwork. Each workshop focuses on hands-on skills. Participants learn nuts-and-bolts techniques such as interviewing, video editing, archival record-keeping, and public presentation. They experience the work of local artists, often through trips to the artists’ studios or homes. The Community Scholars program expands awareness of and broadens interest in Missouri’s traditional arts, and extends the reach of the Missouri Folk Arts Program far beyond its professional staff. Community Scholars often function as advisers, presenters, blog writers, and project partners. Photo #1 (top): Workshop participants get hands-on fieldwork experience at the St. Louis shop of master violin-maker Geoffrey Seitz. 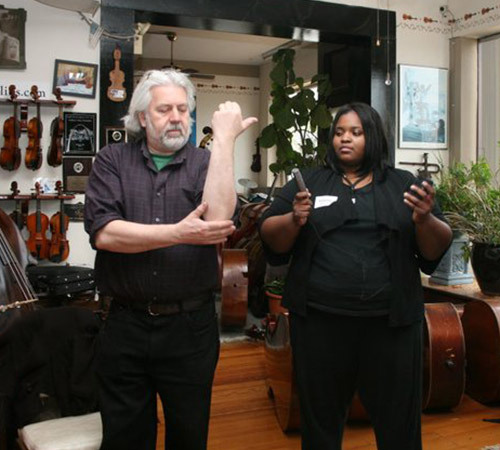 As he talks about his craft, workshop participant Angela Williams records him. 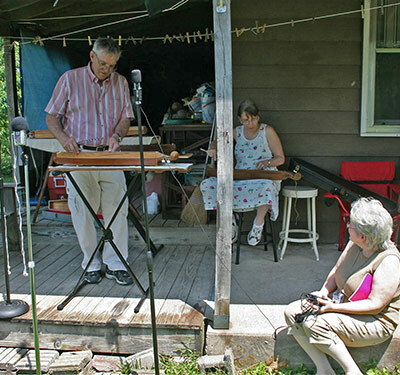 Photo #2: During a workshop in Springfield, participants visit Don Graves, master of old-time dulcimer playing and instrument building. Springfield musician Julie Henigan joins him on the front porch of his Lebanon home for a concert of old-time music. At right is workshop participant Katharine Arnall. Every April since 1988, MFAP and the Department of Natural Resources’ Missouri State Museum in Jefferson City have partnered to bring artists to the museum to do hands-on demonstrations and performances for schoolchildren. The artists for “Folk Arts @ the Capitol” are all teams of masters and apprentices with the Traditional Arts Apprenticeship Program. 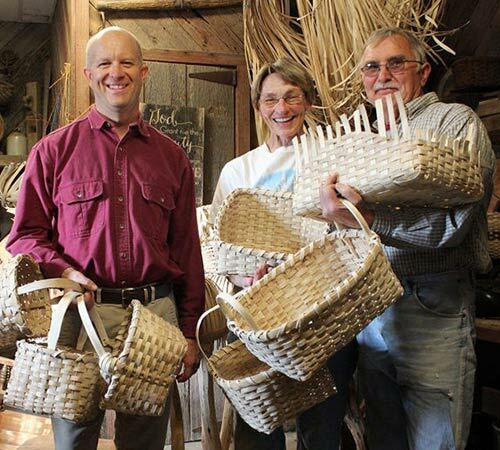 The 2018 event featured master basketmakers Joe and Alice Dudenhoeffer of Linn and their apprentice Aaron Holsapple of Jefferson City. MFAP also conducts various projects in elementary and high school education. For instance, master storyteller Gladys Coggswell of Frankford and her apprentice Angela Williams of Hannibal led week-long residencies at Lee Expressive Arts Elementary School and West Boulevard Elementary in Columbia, which led to the students’ own storytelling performances by students. Photo #1 (top): The master/apprentice team of apprentice Aaron Holsapple of Jefferson City and masters Alice and Joe Dudenhoeffer of Linn (left to right). Every step of making their white oak baskets is done by hand, beginning with harvesting the trees on the Dudenhoeffers’ farm. Find out more in the Museum Magazine article From Tree to Basket. 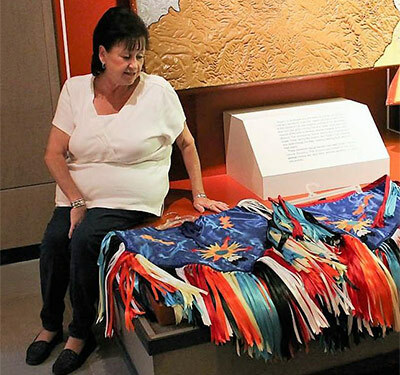 Photo #2: At the Missouri State Museum in the Capitol, master artist Dona McKinney of Holts Summit demonstrates ribbon-work regalia for the traditional Southern Plains Grass Dance performed at intertribal pow-wows in Missouri.